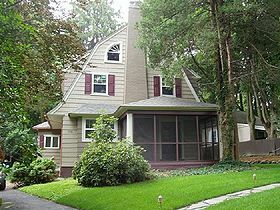 Dutch Colonial (1615-1674) - Dutch Colonial is a style of American domestic architecture, primarily characterized by gambrel roofs having curved eaves along the length of the house. 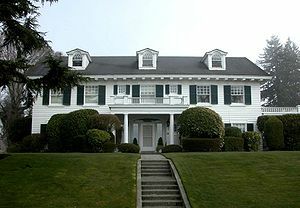 Modern versions built in the early 20th century are more accurately referred to as "Dutch Colonial Revival," a subtype of the Colonial Revival style. Georgian Architecture (1720-1840) - Georgian architecture is the name given in most English-speaking countries to the set of architectural styles current between 1720 and 1840. It is eponymous for the British monarchs George I-IV, who reigned in continuous succession from August 1714 to June 1830. American Colonial Architecture (1720-1780) - American colonial architecture, also called Colonial Georgian, characterizes the style of domestic architecture, church buildings and some institutional and government buildings that were built in America from the earliest colonies until the Neoclassical architectural style locally called "Federal" replaced in for high-style buildings in the 1780s. 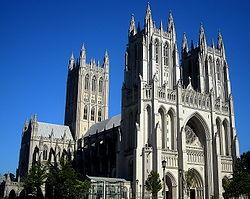 Gothic Revival Architecture (1760–1840) - Gothic Revival is an architectural movement which began in the 1740s in England. In the early nineteenth century, increasingly serious and learned admirers of neo-Gothic styles sought to revive medieval forms, in contrast to the classical styles which were then prevalent. 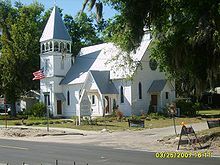 The movement has had significant influence throughout the United Kingdom as well as the United States, and perhaps the number of Gothic Revival structures built in the nineteenth and twentieth centuries exceeds the number of authentic Gothic structures that had been built previously. Neoclassical Architecture - Neoclassical architecture was an architectural style produced by the neoclassical movement that began in the mid-18th century, both as a reaction against the Rococo style of anti-tectonic naturalistic ornament, and an outgrowth of some classicizing features of Late Baroque. In its purest form it is a style principally derived from the architecture of Classical Greece. 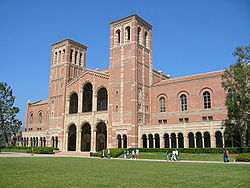 Subsets of Neoclassical Architecture include Adams (UK), Federal and Empire. -----Federal Architecture (1780-1830) Federal-style architecture occurred in the United States between 1780 and 1830, particularly from 1785 to 1815. The period is associated with the early Republic, and the establishment of the national institutions of the United States. The founders of the United States consciously chose to associate the nation with the ancient democracies of Greece and Rome. 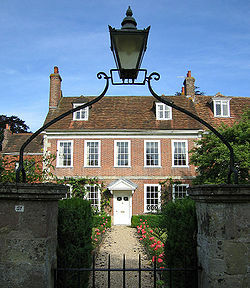 This was a deliberate and marked contrast with the Gothic style, which was used for many English public buildings and associated with feudalism. Federal style takes influence from the Georgian Neoclassical style, but differs in its use of plainer surfaces with attenuated detail; it was most influenced by the Adam style, an interpretation of Ancient Roman architecture fashionable after the unearthing of Pompeii and Herculaneum. The Bald Eagle was a common symbol used in this style, with the ellipse a frequent architectural motif. This style is also referred to by its era: Federal Period. -----Empire Style (1804-1814 & 1870 Revival) -The Empire Style, sometimes considered the second phase of Neoclassicism, is an early-19th-century design movement in architecture. The style originated in and takes its name from the period when Napoleon I ruled France, known as the First French Empire. An earlier phase of the style was called the Adam style in Great Britain and "Louis Seize" or Louis XVI, in France. The Empire style was based on aspects of the Roman Empire and its many archaeological treasures which had been rediscovered starting in the 18th century. Empire designs heavily influenced the American Federal style (such as the United States Capitol building), and both were forms of propaganda through architecture. 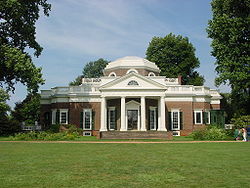 Jeffersonian Architecture (1790-1830 Virginia) - Jeffersonian Architecture or Jeffersonian Colonial is an American form of Neo-Classicism or Neo-Palladian based on U.S. president and patriot, Thomas Jefferson's designs of his home, Monticello, his retreat at Poplar Forest, the University of Virginia, and his design of Barboursville for his friend and political ally James Barbour. The style was popular in the early American period about the same time period as the more mainstream Greek Revival architecture was in vogue. Italianate (c.1802) - Italianate style of architecture was a distinct nineteenth-century phase, in which Italian sixteenth-century models and architectural vocabulary, which had served as inspiration for both Palladianism and Neoclassicism, were now synthesized with picturesque aesthetics, to create an architecture that, though it was also characterized as "Neo-Renaissance", was essentially of its own time. American Empire (c.1810) - American Empire is a French-inspired Neoclassical style of American furniture and decoration that takes its name and originates from the Empire style introduced the First French Empire period under Napoleon's rule. It gained its greatest popularity in the U.S. after 1810 and is considered the second, more robust phase of the Neoclassical style, which earlier had been expressed in the Adam style. 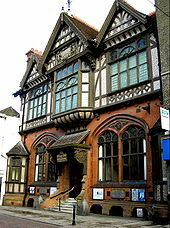 Tudorbethan Architecture (1835–1885) - The Tudorbethan Style of the 20th century (also called Mock Tudor), first manifested itself in domestic architecture beginning in the United Kingdom in the mid to late 19th century based on a revival of aspects of Tudor style. It later became an influence in some other countries, especially the British colonies. Victorian Architecture (1837) - Victorian Architecture can refer to one of a number of architectural styles predominantly in the Victorian era. As with the latter, the period of building that it covers may slightly overlap the actual reign, 20 June 1837 – 22 January 1901, of Queen Victoria after whom it is named. The photograph to the right shows the 'painted ladies' - a prime example of Victorian Architecture found in San Francisco. Jacobethan (1838) - Jacobethan is the style designation coined in 1933 by John Betjeman to describe the English Revival style made popular from the 1830s, which derived most of its inspiration and its repertory from the English Renaissance (1550 - 1625), with elements of Elizabethan and Jacobean. Its main characteristics are flattened, cusped "Tudor" arches, lighter stone trims around windows and doors, carved brick detailing, steep roof gables, often terra-cotta brickwork, balustrades and parapets, pillars supporting porches and high chimneys as in the Elizabethan style. 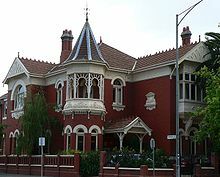 Examples of this style is the Sandringham House in Norfolk, England. Carpenter Gothic (c. 1840-) Carpenter Gothic, also sometimes called Carpenter's Gothic, and Rural Gothic, is a North American architectural style-designation for an application of Gothic Revival architectural detailing and picturesque massing applied to wooden structures built by house-carpenters. The abundance of North American timber and the carpenter-built vernacular architectures based upon it made a picturesque improvisation upon Gothic a natural evolution. Carpenter Gothic improvises upon features that were carved in stone in authentic Gothic architecture, whether original or in more scholarly revival styles; however, in the absence of the restraining influence of genuine Gothic structures, the style was freed to improvise and emphasize charm and quaintness rather than fidelity to received models. Romanesque Revival Architecture (1840–1900) - Romanesque Revival (or Neo-Romanesque) is a style of building employed in the late 19th century inspired by the 11th and 12th century Romanesque style of architecture. Popular features of these revival buildings are round arches, semi-circular arches on windows, and belt courses. Unlike the classical Romanesque style, however, Romanesque Revival buildings tended to feature more simplified arches and windows than their historic counterparts. 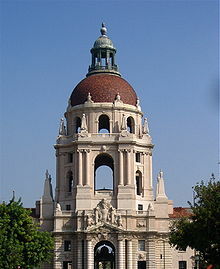 The style was quite popular for courthouses and university campuses in the late nineteenth and early twentieth century. 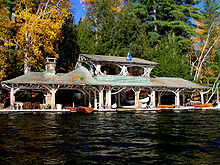 Adirondack Architecture (1850s New York) - Adirondack Architecture refers to the architectural style generally associated with the Great Camps within the Adirondack Mountains area in New York. The builders of these camps used native building materials and sited their buildings within an irregular wooded landscape. These camps were built to provide a primitive, rustic appearance. Elements such as whole, split, or peeled logs, bark, roots, and burls, along with native granite fieldstone, were used to build interior and exterior components. Massive fireplaces and chimneys built of cut stone are also common within the Great Camp architecture. The use of native building materials was not only for promoting a natural appearance, but also to avoid the expense of transporting conventional building materials into a remote location. Second Empire (1865 and 1880) - Second Empire is an architectural style that was popular during the Victorian era, reaching its zenith between 1865 and 1880, and so named for the “French” elements in vogue during the era of the Second French Empire. While a distinct style unto itself, some Second Empire styling cues, such as quoins, have an indirect relationship to the styles previously in vogue, Gothic Revival and Italianate eras. In the United States, the Second Empire style usually combined a rectangular tower, or similar element, with a steep, but short, mansard roof; the roof being the most noteworthy link to the style’s French roots. This tower element could be of equal height as the highest floor, or could exceed the height of the rest of the structure by a storey or two. 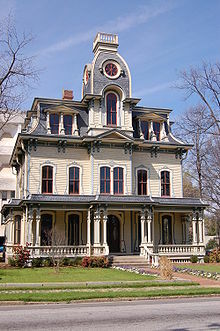 The mansard roof crest was often topped with an iron trim, sometimes referred to as “cresting”. In some cases, lightning rods were integrated into the cresting design, making the feature useful beyond its decorative features. The exterior style could be expressed in either wood, brick or stone. More elaborate examples frequently featured paired columns as well as sculpted details around the doors, windows and dormers. 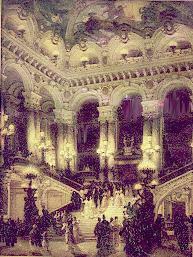 The purpose of the ornamentation was to make the structure appear imposing, grand and expensive. Queen Anne Style Architecture (c.1870–1910s) - Queen Anne Style buildings in America came into vogue in the 1880s, replacing the French-derived Second Empire as the "style of the moment." The popularity of high Queen Anne Style waned in the early 1900s, but some elements, such as the wraparound front porch, continued to be found on buildings into the 1920s. In America, Queen Anne generally refers to an era of style, rather than a specific formulaic style in its own right. 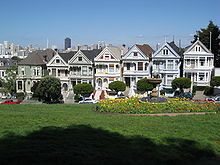 Unlike its British counterpart's use of "crisp white trim", Queen Anne in America eschewed white for bold color resulting in Polychrome paint schemes on exteriors, often referred to as painted ladies, a term that rose in popularity in the 1970s. E. Francis Baldwin's stations for the Baltimore and Ohio Railroad, built variously of brick and wood, are also familiar examples of the style. Eastlake Style (1879-1905) New England - The Eastlake style's importance is delineated by the use of geometric shapes made possible by modern machine techniques of the era. By making these intricate shapes with machines, it was possible to duplicate the exact complex patterns repeatedly, and in unusual places, such as the inside plates of a hinge. It's important to realize, however, that Eastlake always emphasized "simple, elegant motifs" rather than the florid decorative excesses of high Victorian style, and the majority of the items labeled "Eastlake" appalled him, as he frequently wrote during his lifetime. 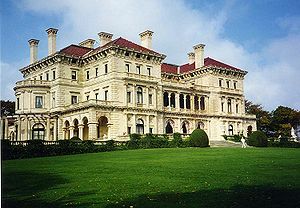 This is particularly evident in the United States, where basic Eastlake motifs were usually multiplied into a dizzying geometric mandala of Victorian intricacy. 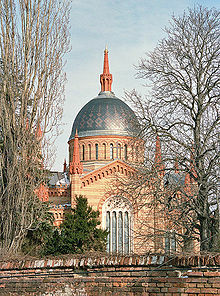 Neo-Byzantine (1882–1920) - Neo-Byzantine architecture is an architectural revival style, of the mid- to late 19th and early 20th centuries, most frequently seen in religious, institutional and public buildings. Neo-Byzantine architecture incorporates elements of the Byzantine style associated with Eastern and Orthodox Christian architecture. The style is characterized by round arches, vaults and domes, brick and stucco surfaces, symbolic ornamentation, and the use of decorative mosaics. 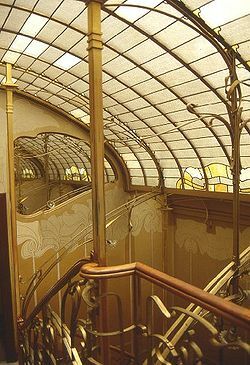 Art Nouveau/Jugendstil (c. 1885–1910) - Art Nouveau, also known as Jugendstil, is an international movement and style of art, architecture and applied art—especially the decorative arts—that peaked in popularity at the turn of the 20th century (1890–1905). A reaction to academic art of the 19th century, it is characterized by organic, especially floral and other plant-inspired motifs, as well as highly-stylized, flowing curvilinear forms. American Craftsman (1890s–1935) - The American Craftsman Style, or the American Arts and Crafts Movement, is an American domestic architectural, interior design, and decorative arts style popular from the last years of the 19th century through the early years of the 20th century. As a design movement, its popularity remained strong until the 1930s, although in the decorative arts it continues to experience numerous revivals until the present day. While the British movement was a Victorian-era phenomenon, its translation to the American setting took place precisely at the moment when that era was coming to a close. 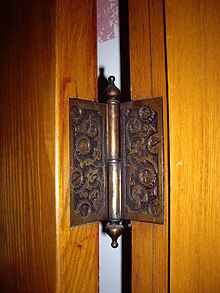 It can be said that the American movement that also emphasized craftsmanship was also a design reform movement that encouraged originality, simplicity of form, local natural materials, and the visibility of handicraft, and was concerned with ennobling the more modest home of the rapidly expanding American middle class. Richardsonian Romanesque (1880s) - Richardsonian Romanesque is a style of American architecture named after architect Henry Hobson Richardson. This very free revival style incorporates 11th and 12th Century southern French, Spanish and Italian Romanesque characteristics. It emphasizes clear strong picturesque massing, round-headed "Romanesque" arches, often springing from clusters of short squat columns, recessed entrances, richly varied rustication, boldly blank stretches of walling contrasting with bands of windows, and cylindrical towers with conical caps embedded in the walling. Colonial Revival (1890s–1915) - The Colonial Revival was a nationalistic architectural style and interior design movement in the United States. Colonial Revival sought to follow the Colonial style of the period around the Revolutionary War, usually being two stories in height with the ridge pole running parallel to the street, a symmetrical front facade with an accented doorway and evenly spaced windows on either side of it. Mission Revival Style (1894-1936) - The Mission Revival Style was an architectural movement that began in the late 19th Century and drew inspiration from the early Spanish missions in California. The movement enjoyed its greatest popularity between 1890 and 1915, though numerous modern residential, commercial, and institutional structures (particularly schools and railroad depots) display this instantly-recognizable architectural style. 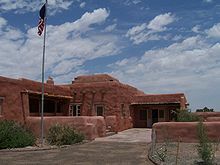 Pueblo Style (1898-1990s) - Pueblos are traditional communities of Native Americans in the southwestern United States of America. The communities are recognized worldwide for adobe buildings, which are sometimes called "pueblos," although some pueblos only have a few of these buildings still standing. Spanish Colonial Revival (1915–1940) - The Spanish Colonial Revival Style was a United States architectural movement that came about in the early 20th century after the opening of the Panama Canal and the overwhelming success of the novel Ramona. Based on the Spanish Colonial style architecture that dominated in the early Spanish colonies of both North and South America, Spanish Colonial Revival updated these forms for a new century. 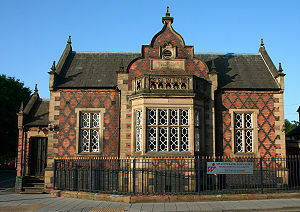 The movement enjoyed its greatest popularity between 1915 and 1931 and was most often exhibited in single-level detached houses. Mediterranean Revival Style (1920s–1930s) - Mediterranean Revival Style Architecture is an eclectic design style that was first introduced in the United States around the turn of the nineteenth century, and came into prominence in the 1920s and 1930s. The style evolved from "rekindled interest in Italian Renaissance palaces" and seaside villas dating from the sixteenth century, and can be found predominantly in California and Florida due to the popular association of these coastal regions with Mediterranean resorts. Art Deco (1925–1940) - Art Deco was a popular international design movement from 1925 until 1939, affecting the decorative arts such as architecture, interior design, and industrial design, as well as the visual arts such as fashion, painting, the graphic arts, and film. This movement was, in a sense, an amalgam of many different styles and movements of the early 20th century, including Constructivism, Cubism, Modernism, Bauhaus, Art Nouveau, and Futurism. Its popularity peaked in Europe during the Roaring Twenties and continued strongly in the United States through the 1930s. Although many design movements have political or philosophical roots or intentions, Art Deco was purely decorative. At the time, this style was seen as elegant, functional, and modern. 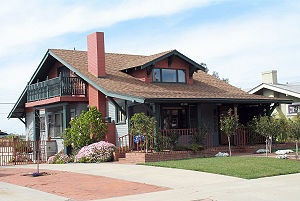 Ranch-Style (1940s-1970s) - Ranch-style houses (also American Ranch, California Ranch, Rambler or Rancher) is a uniquely American domestic architectural style. First built in the 1920s, the ranch style was extremely popular in the United States during the 1940s to 1970s, as new suburbs were built for the Greatest Generation and later the Silent Generation. The style is often associated with tract housing built during this period, particularly in the western United States, which experienced a population explosion during this period with a corresponding demand for housing. The ranch house is noted for its long, low to the ground profile, and minimal use of exterior and interior decoration. The houses fuse modernist ideas and styles with notions of the American Western period working ranches to create a very informal and casual living style. Their popularity waned in the late 20th century as neo-eclectic house styles, a return to using historical and traditional decoration, became popular. However, in recent years the ranch house has been undergoing a revitalization of interest. 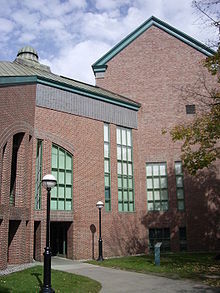 Postmodern Architecture (1980s) - Postmodern architecture was an international style whose first examples are generally cited as being from the 1950s, and which continues to influence present-day architecture. Postmodernity in architecture is generally thought to be heralded by the return of wit, ornament and reference to architecture in response to the formalism of the International Style of modernism. 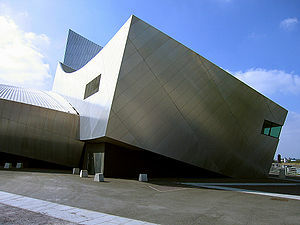 As with many cultural movements, some of postmodernism's most pronounced and visible ideas can be seen in architecture. The functional and formalized shapes and spaces of the modernist movement are replaced by unapologetically diverse aesthetics: styles collide, form is adopted for its own sake, and new ways of viewing familiar styles and space abound. Deconstructivism (1982-) - Deconstructivism in architecture, also called deconstruction, is a development of postmodern architecture that began in the late 1980s. It is characterized by ideas of fragmentation, an interest in manipulating ideas of a structure's surface or skin, non-rectilinear shapes which serve to distort and dislocate some of the elements of architecture, such as structure and envelope. The finished visual appearance of buildings that exhibit the many deconstructivist "styles" is characterised by a stimulating unpredictability and a controlled chaos.